For 20.000 followers and 10.000.000 views, I wanted to thank you and explain how I work ! This is an Article which talks about my workplace, collection, and sorting. 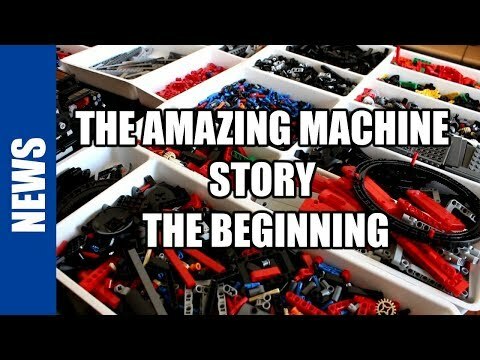 Everything you want to know about my Lego activities. At the end of 2014, I have bought the Cargo Plane #42025 which tooks my storage capacities to its limit, that is why I have bought a 4th Cabinet with plastic drawers. which tooks me the opportunities to res-sort completely my collection, and show you how. My collection is composed (February 2015), of 13 sets, plus some small Lego mini sets (less than 100 parts with no interesting parts except maybe some tires. Plus some parts I have added from before my Darkage, including yellow studfull plates and liftarms and some tires (which I will developed next). I will start by listing my collection and how I use it. 8420 Motorcycle : The first lego of after my Darkage, bring me to the studless world. Apart wheels, some panels and shock absorbers, this set is not interesting for Mocing. 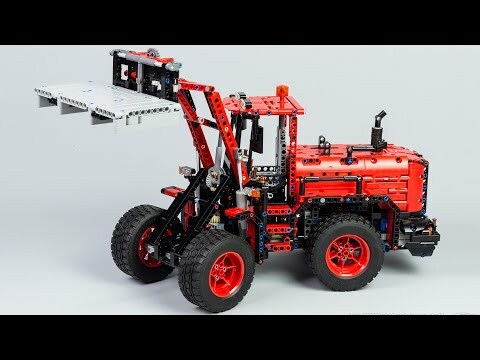 8436 handling truck : My second Lego set. Many parts used, the gray and black beam, wheels and of course pneumatic and red parts. This set has been the most used set for me to create truck and handling equipment at the beginning of my story. 8284 Tractor : This tractor are not very useful because of the different size of this tires, plus limited quantity of lime parts. I could easily separate this model from my collection. 8455 Bach-Hoe Loader : A masterpiece of Lego, My bank for Pneumatic cylinders, switch and pump with of course yellow parts. 8145 Ferrari GTB : A an other big used set for me because it is the first who have red panel, suspensions parts and big vehicle tires. Why I have used many time for creating red vehicle. 8275 Motorized Bulldozer : Now with this set, I was capable of motorize my creations with the power functions. It also bring to me the yellow parts and tracks. 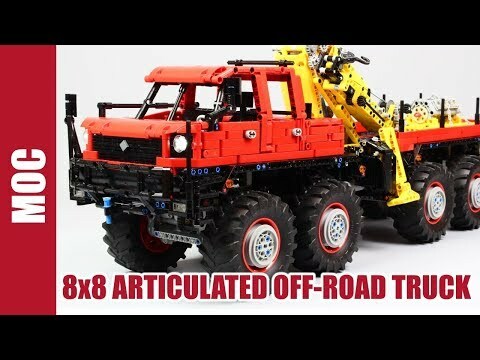 With all the set before, I was capable to building anything basic I want : supercar, trial truck and handling and construction equipment, with the limit of red and yellow parts. 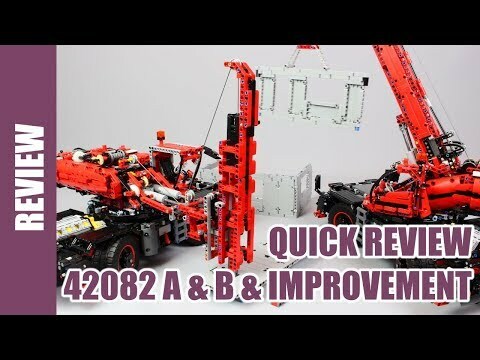 8258 Crane Truck : Buy for this huge amount of grey, yellow and red parts, including lot of new panel which has been used for new supercar. the Linear actuator, tires and motor are also interesting regarding the price. 8264 Hauler Truck : Only by for the yellow parts, including special panel, and yellow rim. Plus a motor, still good to have. 8051 Motorcycle : Buy for its new wheels and some small panels (in red and black) and because I like motorcycle ! 8265 Front Loader : A good set regarding the part. Including big wheels with yellow rims, lot of beam, gearing, linear actuator and bucket. A good deal for having interesting parts. At this stage, with my whole collection, I was abbe to build new supercar with new panels (in red), some handling and construction equipment in yellow with no limit of functionality or parts and new trial truck. 8110 Mercedes Unimog : The new unimog, with lot of interesting parts, the big wheel (that I have never used at this moment), orange panel, portal hubs, motor and pneumatic and lot of beam, gearing and so on, very good to have but onyl if you ahve other set for colored parts. 9398 Crawler : The crawler featured lot of new parts including the well-known Servo-Motor and new L-motor. Also, some orange parts and black parts are interesting, including panel, beam and connector, in fact, there is a company who offer me this set. At this stage, I was able to motorize differently my creations with the L motor (which runs at idle speed of a M motor but with more torque), and with the servo motor that I use for the first time on the rally car, then on the ATV quad. Also, the stock of orange parts starts to be interesting enable me to create some creations with basic orange parts like my crawler. At this point I can create red, yellow and orange colored creation. 42025 Cago Plane : A very good set for parts, white of course ! I have bought this only for the huge amount of white parts, and the small linear actuator. This enables me to make White colored creations with some blue parts. And Forced me to re-sort my whole collection. Plus this set, I have, as said previously, some yellow beam and plate in order to create the studfull structure used in the machine I create, like the Mechanical loom or The Digicomp, of my latest clock. I have also some tires from my dark age, including the wheels from the iconic 8880 supercar (including the whole system of suspension but a bit used now), the wheel of the futuristic 8432 Concept Car and some other wheels for small lego buggy but often in two quantity, not in four. I have also some thin tires which come from Old motorcycle like the 8838 or 8857 for the slick version. I don’t buy always set from Lego for having parts, I used also Bricklink to get spare parts, including news released parts. When I want some news parts, I look for the last released set to know which of them buy to get the most useful parts for me. for instance, the 42001 Grand Prix Racer will be good for new hub and white panel, the new 42038 Artic Vehicle for the orange parts and black tracks, or the new 42039 LMP1 Supercar to have lot of green parts (new color for my collection, cool huh ?). Buying a set is not a problem of money because my Lego activities finance what I need but a problem of space. In deed, If I buy many set to have new parts, what can I do with the parts I don’t need, for instance, grey and black axle, connector and beam ? I have now enough of that so I don’t want it. Why ? Because I think the most thing important when create lego stuff is to have a good sorting system and good collection, which means that you have not to search for many minutes a part which is not sort correctly or have more parts that you need. I like my small collection, it is stored in only 4 cabinets with plastic drawer which enables me to have all I want on my desk (not on different level, not on the ground or on big mixed box), at easy reach. That is why, when no sets have the correct inventory of have lot of useless parts for me, I do not buy Lego set but spare parts on bricklink. It is like that, that I have bought suspension system, new hub from the 420001 Racer, or some big gearing (40th gear), colored beam and connector, or tires. My workplace is composed of 4 metal cabinet with plastic drawer from the Raaco Brand. Thes Metal Case are very practical, because with a tiny modifications for the small case, it can handle the long 15L Beam (14L stud lenght in standard) (see the picture at the end of this article), and are not expensive (15 to 30€ in France). Therefore my collection is packed in this 4 metal cases. Plus the candy box on the top on the second which is full of electric component (motor, IR receiver, Battery Box..), and the metal box on the middle which handle the whole studfull liftarm and plate I have in yellow). To finish, the tires and wheels are located in the pink bag on the ground, which is full ! This a not a professional photography studio but enables me to make correct pictures with enough light and white background. But this asperity is not a problem because it can not be visible in the picture, especially with the exposure. For the source of light, I have three. The first is the most important and is a hole of light in my flat on the ceiling. It enables me to have very white and natural light which doesn’t color the picture. The second light is also a natural light which comes from the left from the door. It enables me to shatter the shadows to reduce the projected shadow. The last light I have is a powerful Halogen lamp which I use only when I have not enough light but it tends to colored in yellow the picture even with the white-balance in yellow-bulb. This installation is due to my flat, not me, therefore it is a chance to have this hole of light which allows me to make good picture since I lived in (since the Braiding Machine). I am not a professional, these tips are some tips I have experienced, I hope it will help you ! For future purchase, I think I will buy a Canon 500 or 700D which can film at 1080p with manual focus during the video and a rendering typically reflex (small focal lens and detailed rendering). I will show here my method for sorting my collection and then the different techniques for sorting. First of all I use 4 metal cabinet with plastic drawer from the Raaco Brand. This Metal Case is very practical, because with a tiny modifications for small case, it can handle the long 15L Beam (14L stud lenght in standard). Also, I prefer vertical cabinet than horizontal because it fills the vertical space which we don’t need to create (we need horizontal space to create) and can handle many parts for its size. I don’t like the solution for having many containers which are not attached together it can move and fall and spread all the parts in the room. The Vertical cabinet is the better solution to maximize the space for building, and sorting the parts. First cabinet : the black and gray beam. If you buy lego set, you will have certainly more parts in black and gray than other color, it is due by the use of black and gray as a common color for frame in Lego set. That is why I have a dedicated cabinet for black and gray beam. Classified by color and size. Parts are sorts by color (black and then gray) and by size respectively : 15L, 13L, 11L, 9L, 7L, 5L, 5L thin, 2&3L, T shape 3×3, L shape (3×5 then 2×4) and angled beam. Sorting the beam by using the length of the case will increase the amount of beam you can store. Don’t put it in mess. A well organized 7L beam in the plastic case, which gain 50% of storage capacities than the mess solution. Thin Beams are always complicated to store. Because if you have not enough, you can store with the classic beam but they will be sometime hard to find and hard to know your stock (how many thin parts does it remain ? ), and if you have enough, it keep a whole case but never full. The solution I use is to store all thin beam in one plastic case, therefore mix the 5L, 6L and 7L thin beam together (each color separated). 7L beam and the left, 5L beam and the right, and all thin beam (5 6 and 7L) is a last plastic case. Sorting the close color will be the same problem as the thin parts, you have not enough to fill a plastic case and don’t want to mix the size because of difficulty to know your available stock. Concerning the beam, I use a plastic case dedicated to a color and size, because my stock is not so important and I wanted to keep the visibility of available parts. If you have really few of these parts, you can mix it by color or size. But if you can fill half of space, I encourage you to not mix. Each size and color has its plastic case, only if this is important or rare parts in your collection. It is the most difficult parts to store. They are useful parts but have a T or L shape which is complicated to store and fill quickly the space in the plastic case, and of course, we have dozen of it. Quickly available parts at left, and stored parts at the right. 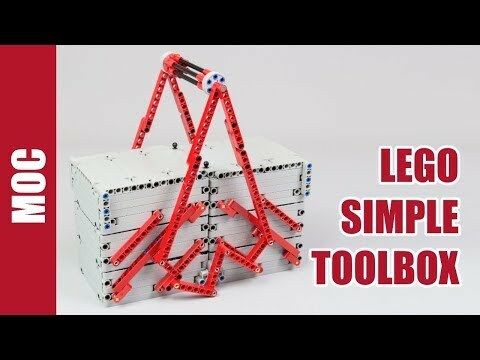 Thes techniques enables me to have quickly parts I need and maximize the storage I have for T and L shape because I never use the whole collection of L shape in the same creation. This metal case has not many techniques for sorting. I sort my part by type and color. For instance, the black connector and gray connector. Then the gearing (respectively : smaller than 20t bevel, bigger than 20t bevel, 16t, driving ring, 24t differential and clutch, and to finish, gear bigger than 24t : 36 and 40t. Then I sort the bush pin by color, the bush, and the axle by size. My third cabinet is to store the big parts which is impossible to organize to maximize the space or to store the high quantity of small parts. For instance, I use it for store my whole collection of panel (black, red, orange and white and blue). Because they are impossible to organize correctly to store because of their shape, therefore I place them it big plastic case. I use also the big plastic case for storing pneumatic element, shock absorber or wheel hub and frame. all this parts are difficult to store and this is the only solution which is convenient for finding parts. The last parts I store here is the technic pins 2L and 3L and axle pin, because I have thousand of it and do not want to have many small plastic case full of pins, here, I have only one plastic case which stores all pins. Fourth Cabinet : rare parts and beam connectors. My fourth cabinet is a bit special, it is not very well optimized because I use to store many things, in fact I use to store all parts I can not store elsewhere. That is why there is linear actuator, flex system, GBC balls, triangle, thin liftarm stored by color, brick, rack and pneumatic hose. Then at the bottom, a collection of straight panel, old panel, and engine parts. In fact I keep this cabinet only because it has exactly the size to store 28 straight panels with maximized space. This is the last cabinet I have purchased, in order to handle the whole white part I have for the cargo plane. Therefore, it contains only colored beam, and use the same method of the gray and black beam sorting, plus some tips dedicated to parts I have in small quantity. If you have some parts in rare colored, don’t use a plastic case for each color and size. Mix the color, it will be well identifiable and doesn’t take many place. If you have different parts in different size but in same color, you can mix the different sized parts together. This is my case for instance with the white beam in 15L and 13L. I have only 6 beam in 13L so no need to take it in a plastic case, just mix it with the closer size which is the most empty : the 15L in my case. In the same way, If you have special shaped parts like T or L shape in a small quantity and you want to keep the visibility of stock without take storage, you can mix the shape with the color in a same plastic case. It is a little bit a mess, but maximize your storage, but I encourage you to not mix more than 2 shape and 3 colors. Angled shape are not easy to store. I use the same method for store the L shape, by using an axle to maintain parts together and store it in organized way. For the angled shape, the second tips is to use the shape of them to minimize the empty space. For that, I use a staggered row as shown on the picture which enables me to maximize the storage capacities despite the angled shape of this part. I hope you will know now more about my collection, why I have bough some set, and what set is useful for some type of creation and have understood how to organize correctly your sorting system in order to maximize the stored parts and reduce the time needed to find a part. Remember, if you don’t find a part you need quickly, there is a problem in your sorting system, and it is independent of the amount of parts in your collection ! how do you store youre tires and rims? I’ve thought you might had at least a thousand sets, can’t believe there are only 13. You can see it on the picture in the gallery at the end of the article. It consist in cutting the bottom plan. Fill the plastic case with 15L and refix the botton plan with scotch tape. What exactly is the “tiny modification” you are mentioning for the small case in order to fit the long 15L Beam?